This is “Recruiting, Motivating, and Keeping Quality Employees”, chapter 7 from the book An Introduction to Business (v. 1.0). For details on it (including licensing), click here. Howard Schultz has vivid memories of his father slumped on the couch with his leg in a cast.Introductory material on Howard Schultz and Starbucks comes from Howard Schultz and Dori Jones Yang, Pour Your Heart into It: How Starbucks Built a Company One Cup at a Time (New York: Hyperion, 1997), 3–8. The ankle would heal, but his father had lost another job—this time as a driver for a diaper service. It was a crummy job; still, it put food on the table, and if his father couldn’t work, there wouldn’t be any money. Howard was seven, but he understood the gravity of the situation, particularly because his mother was seven months pregnant, and the family had no insurance. This was just one of the many setbacks that plagued Schultz’s father throughout his life—an honest, hard-working man frustrated by a system that wasn’t designed to cater to the needs of common workers. He’d held a series of blue-collar jobs (cab driver, truck driver, factory worker), sometimes holding two or three at a time. Despite his willingness to work, he never earned enough money to move his family out of Brooklyn’s federally subsidized housing projects. Schultz’s father died never having found fulfillment in his work life—or even a meaningful job. It was the saddest day of Howard’s life. 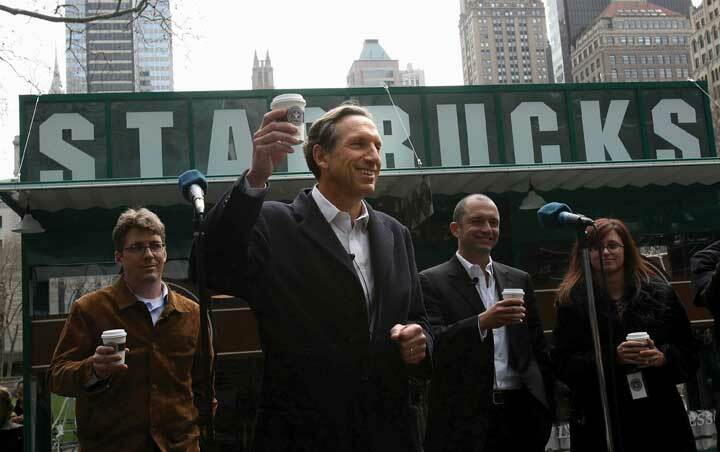 Howard Schultz toasts at the launch of their new “everyday” brew, Pike Place Roast, April 8, 2008, in Bryant Park in New York City. As a kid, did Schultz ever imagine that one day he’d be the founder and chairman of Starbucks Coffee Company? Of course not. But he did decide that if he was ever in a position to make a difference in the lives of people like his father, he’d do what he could. Remembering his father’s struggles and disappointments, Schultz has tried to make Starbucks the kind of company where he wished his father had worked. “Without even a high school diploma,” Schultz admits, “my father probably could never have been an executive. But if he had landed a job in one of our stores or roasting plants, he wouldn’t have quit in frustration because the company didn’t value him. He would have had good health benefits, stock options, and an atmosphere in which his suggestions or complaints would receive a prompt, respectful response.”Howard Schultz and Dori Jones Yang, Pour Your Heart into It: How Starbucks Built a Company One Cup at a Time (New York: Hyperion, 1997), 138. Schultz is motivated by both personal and business considerations: “When employees have self-esteem and self-respect,” he argues, “they can contribute so much more: to their company, to their family, to the world.”Howard Schultz and Dori Jones Yang, Pour Your Heart into It: How Starbucks Built a Company One Cup at a Time (New York: Hyperion, 1997), 6–7. His commitment to his employees is embedded in Starbuck’s mission statement, whose first objective is to “provide a great work environment and treat each other with respect and dignity.”“Starbucks Mission Statement,” Starbucks.com, http://www.starbucks.com/aboutus/environment.asp (accessed May 6, 2006). A major piece of the Starbucks success story has been the superior service provided by its motivated employees.